It would be interesting to go back further in time. Other includes cycling and walking. 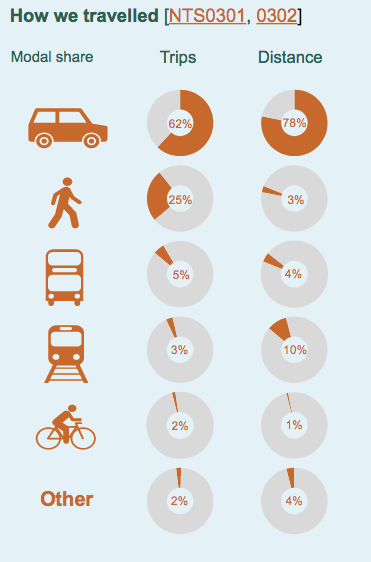 An updated stat to show cycling accounts for just 2% of journeys in England. 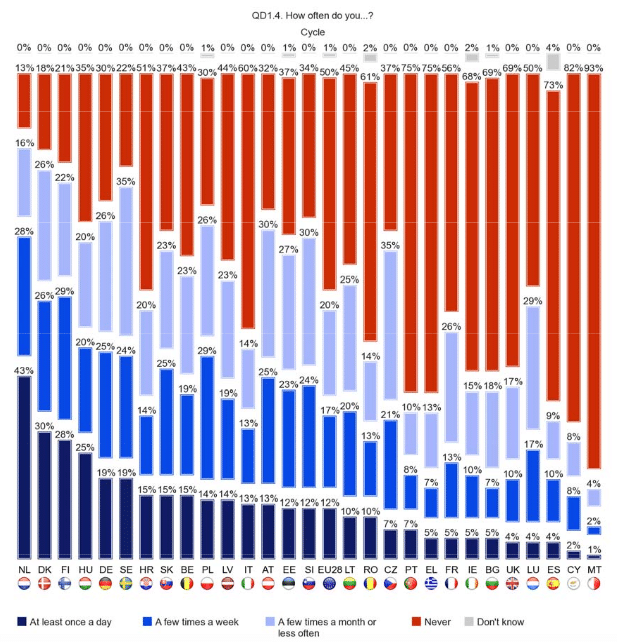 Britain still lags behind countries with similar weather, population density and geography. Inspired by the National hill climb, I went out for a 30 mile training ride yesterday to Brill. It was a beautiful autumn day, but unfortunately, I was in discomfort by the end of the ride. I was plodding along St Clement’s at a fairly sedate speed when I got overtaken by a young lad on a mountain bike, backpack and big mudguards. There was me – on a state of the art – Trek Emonda, Dura Ace Di2, several thousand pound Carbon fibre bike, and here I was getting overtaken by a young lad, taking home the weekly shopping. Welcome to the future. On the positive side, he mentioned he is getting closer to my Brill KOM, but still a good 20 seconds off. So at least for a short-while, I can live on my past glories of Brill hill. It’s a small world. 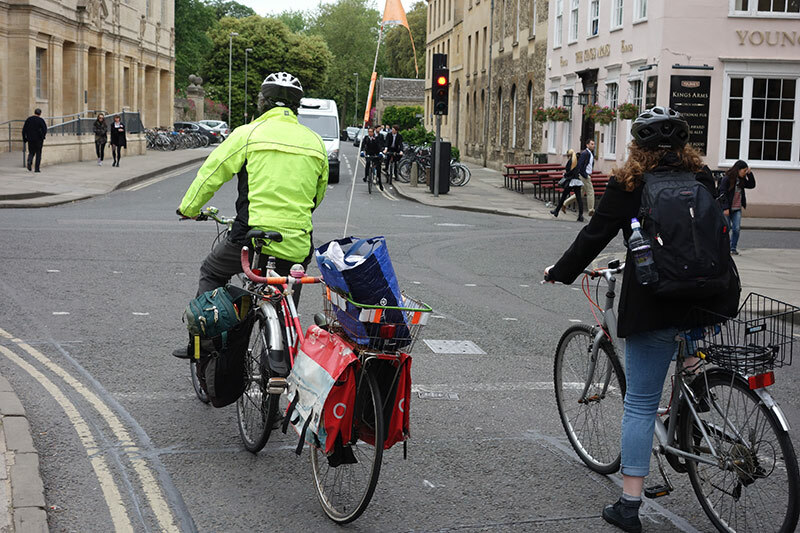 You cycle around Oxford and you don’t know who you are going to bump into next. 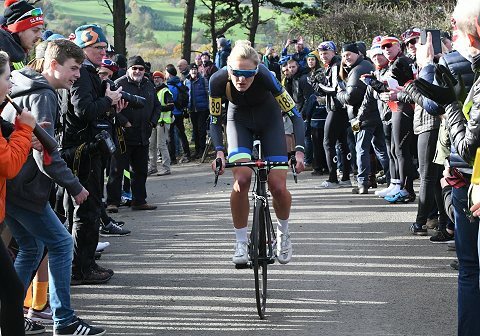 It looks to have been a great national hill climb championship up in the North East. Both Dan Evans ASSOS Equipe UK and Joscelin Lowden (Lewes Wanderers CC) making worthy champions. It’s not quite the same watching results drip through on Twitter – compared to actually racing and being there. Sitting this year out reminded me of what the championship means. Dan has been a very consistent hill climb performer of the past few years. On hills above two minutes, he has rarely been beaten. It’s an impressive open campaign and becomes the first man to take a second championship since Dan Fleeman in 2010. They say hill climbs is a young man’s sport, but a little like myself, Dan came to the sport relatively late. All I can say 36 is a very good age to become national hill climb championship (I was 36 in 2013). Can Dan win again? Well, it doesn’t get any easier as you approach the big 40. 2nd place Adam Kenway (Raleigh GC) put up a spirited title defensive; perhaps next year will be more to his liking. Proving that hill climbs is still a young man’s game, Kieran Savage (Team B38) must be pleased to get third spot, whilst still an espoir. I always feel a certain empathy for people who just finish outside the podium. Jo Clark has consistently finished in the top 5, but is collecting a few near misses. This year just one or two seconds was the difference. Interestingly Clark was the only rider to beat Evans in an open event (on the Rake) – another rider who will be looking forward to the short climb up Shelsey Walsh. With strong competition, there were many very good hill climbers within 10-15 seconds of a podium place. Honourable mention to first Vet man Niall Paterson Velo Club Cumbria. Next year, I might be able to provide some competition in the old man category. In the women’s event, no former champion meant the event was open, but the quality of the field was as strong as ever. I don’t think the women’s podium has been so close – with just 2 seconds separating the top three. It was good to see Hayley Simmonds enter the event and get so close. She is a world class rider and time triallist, but, at the end of a long road season, the rigours of four minute British hill climb make it a real challenge compared to what she is used to riding. Mary Wilkinson (Yorkshire Road Club) produced a superb ride to finish 2nd. After a good open season, Joscelin Lowden (Lewes Wanderers CC) won her first title. 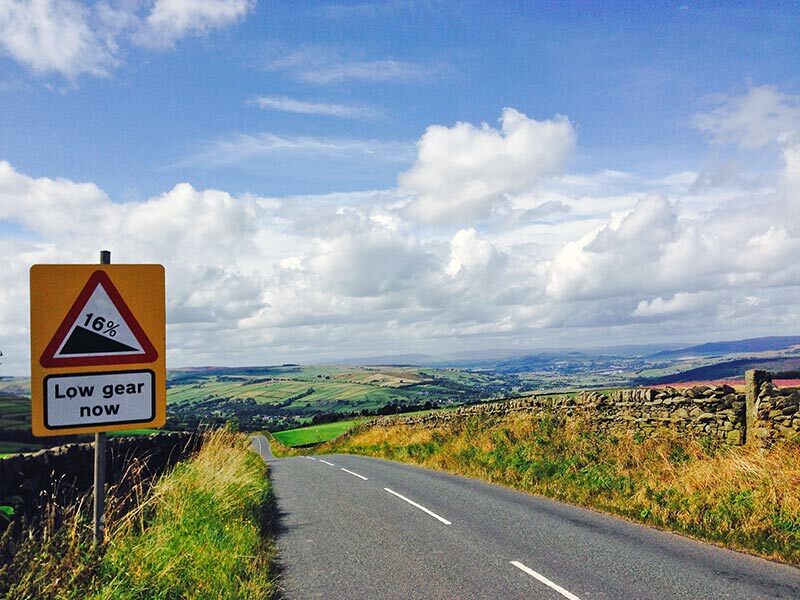 In this CTT report, Lowden sums up the attraction of the hill climb championship. “Some people question why I would come all the way up here to ride for five minutes and I start to think ‘Am I mad?’ but it’s so much more than just riding on a hill. I’ve been waiting for something good to write about, but at this rate I may not post anything at all. It has been a stop-start season, but mostly stop – if not stuck in reverse gear. Sometimes, I can get a few days of training, but then take 2-3 weeks off the bike. It feels like always going back to the starting point. It’s easy to lose inspiration to ride through injury and keep starting from the same low level. 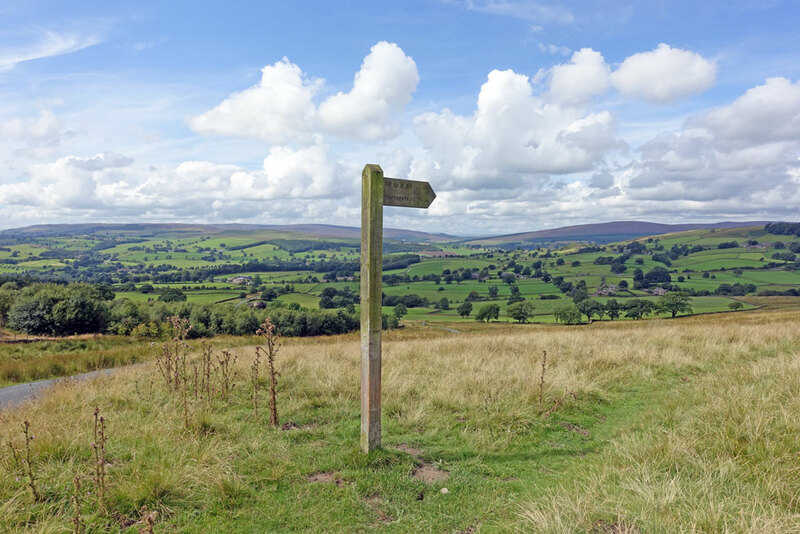 I went out a few times in Yorkshire, getting as far as Grassington. In New York, my longest ride was 26 miles during a marathon as a lead cyclist. 26 miles at an average speed of 9.5 mph. I was knackered the next day from looking behind at the lead runner. Took days to recover. Compared to my three-hour 26 miles, these days there are riders who can ride 25 miles in 43 minutes (35 mph) (with a little help from suitable downhill dual-carriageways). 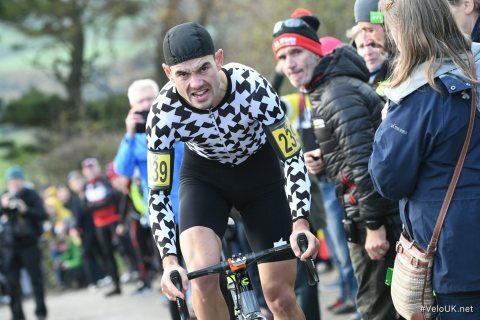 The hill climb season is upon us but I will probably give it a miss this year – perhaps one or two local events; the national is very unlikely at the moment. The only positive thing about the hill climb season is that at least I am at racing weight – an American diet of donuts and fried breakfast has not shifted any weight despite little exercise. But, being light is only one part of the equation. I went to Brill on Saturday and felt suitably slow and unfit. It was a reminder of how much hard work it is training for hill climbs. Of all the hill climbs, I fancy doing the Monsal Head. I think you can do one minute hill climbs without any training. I’m not sure whether this is an observation that would be supported by sports science. But, in New York, I do one hill and have trained on it every year for the past 12 years. Training involves trying to race up it as fast as I can and have kept personal best times. 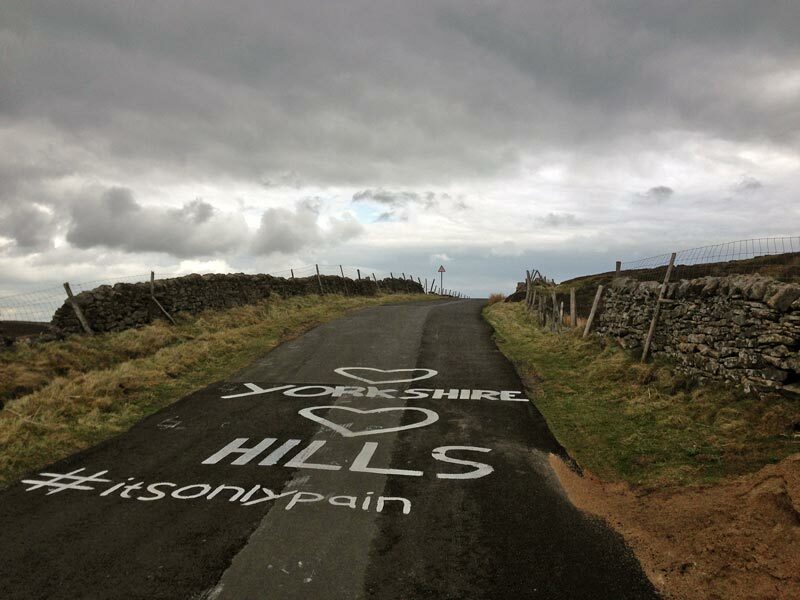 I’m up in Yorkshire, so have been taking the opportunity to cycle up some ‘proper’ hills. I can’t do as much as I would like. Rather like an old man, I seem to take a few days recovery after any effort with ongoing issues. Still, something is better than nothing. After watching the Tour de Yorkshire on tv, I couldn’t resist visiting Lofthouse and Trapping Hill. (I’m not really keen on all this Franglais stuff – Cote d’flipping steep hill sounds a bit weird). Trapping hill brings back memories of my first bike rides, aged 14 – when I went camping at How Steen Gorge and being amazed at how difficult Trapping Hill and Greenhow Hill were. Trapping Hill isn’t quite as invincible as it felt as a newbie cyclist aged 14. When I visited on Saturday, tather fortuitously there was a tailwind up the climb, and the road had been newly repaved. 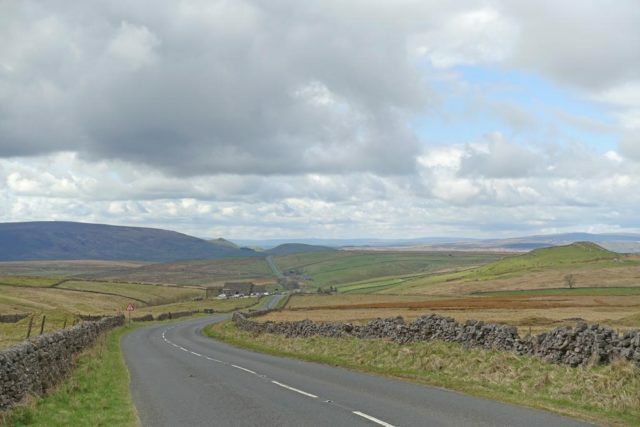 If this smooth road was due to the Tour de Yorkshire effect, I hope it becomes a three-week grand tour. With a three-week Tour we could even afford to have stages across the border in Lancashire. At the moment, it seems all my cycling friends are going off on epic cycle tours around the British Isles. PJ is live blogging from his solo tour from around the abandoned medieval hamlets of Leicestershire and the like. 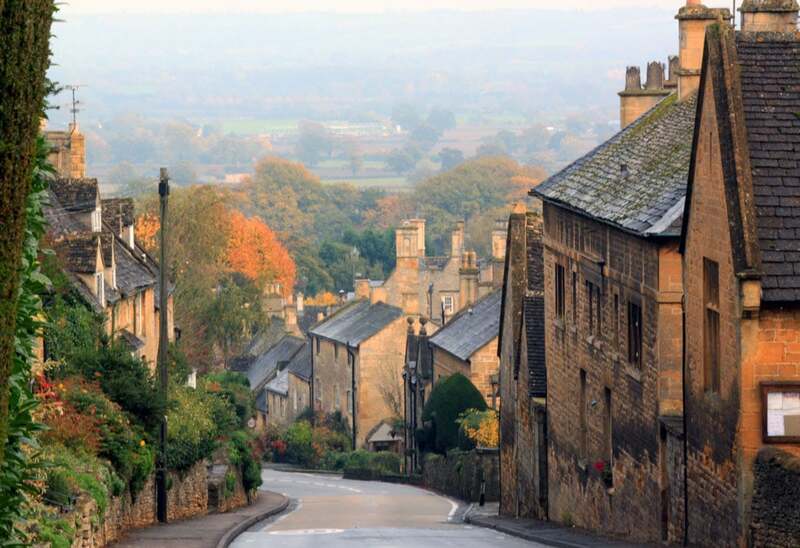 When I went racing around England, I found a similar observation, in places such as Hampshire, Gloucestershire, Leicestershire – you came across all these villages which were quintessentially English in a way you felt only existed in 1950s Mrs Marple films. 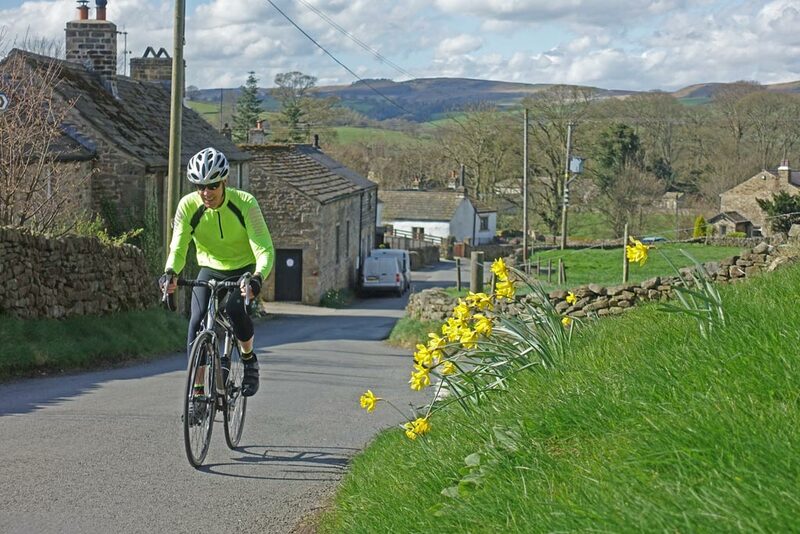 For me, cycling around the countryside was the best education there was more to England than Bradford and the inside of Oxford pubs. I took this photo driving back from Nat HC 2010. But I have cycled up here a few times. Last weekend, I spent three days with no bicycle in Germany and my leg problems got worse. When I got back I actually had to take another day off the bike, at that rate I was despairing of ever seeing an end in sight. But, at the same time, I was hopeful that I could just ride through and keep going. 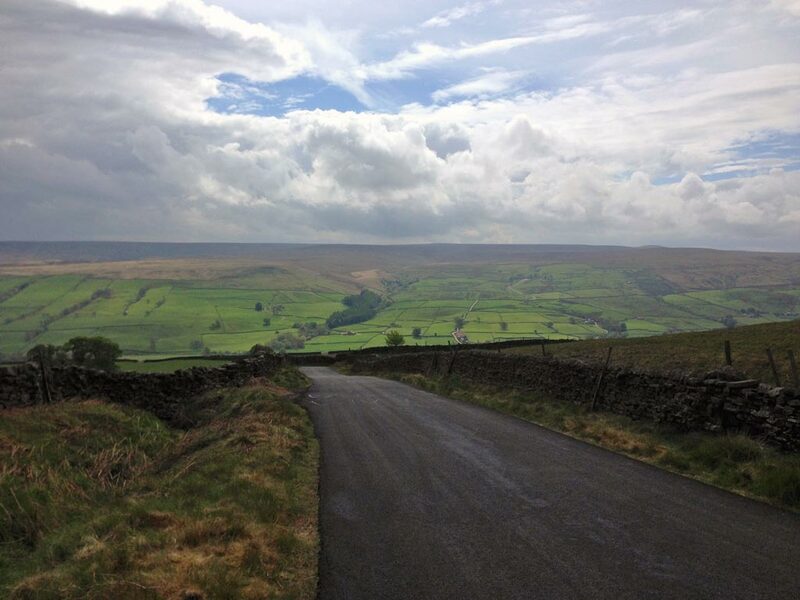 This weekend I’ve been up in Yorkshire, and it’s been great for a few reasons. The weather is excellent. Yorkshire in spring with the sun out takes some beating. But, at least this weekend, the more I cycle the less I’m getting bothered by old injuries and niggles. 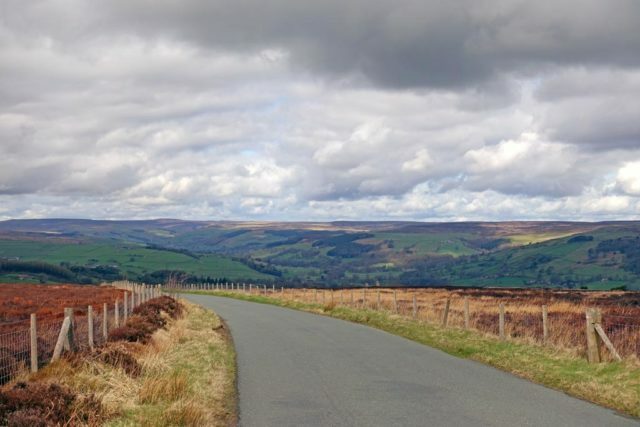 Saturday I made a visit to Pateley Bridge for one of my favourite climbs – Greenhow Hill. All told it was 50 miles and just short of 2,000m of climbing. 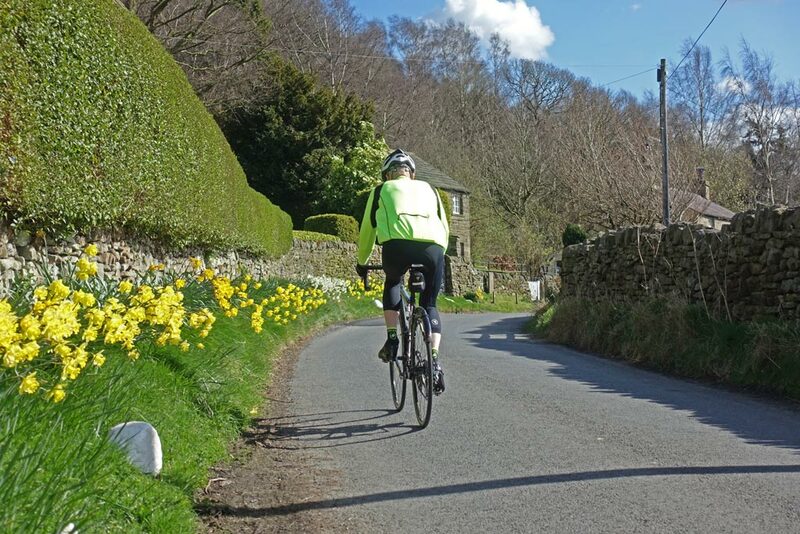 After an easy day going to Grassington, (an easy day in the Yorkshire Dales can still mean 1,000m of climbing) I went south-west towards Silsden and some steep hills around there. This year I’ve done relatively little in terms of volume of training (compared to previous years), But, in the past week, I’ve started to feel in good shape. The top end fitness has come back quite quickly. It is also a psychological boost to get the summer bike out of the loft. Ellers Road looking back towards Sutton-in-Craven near Keighley. 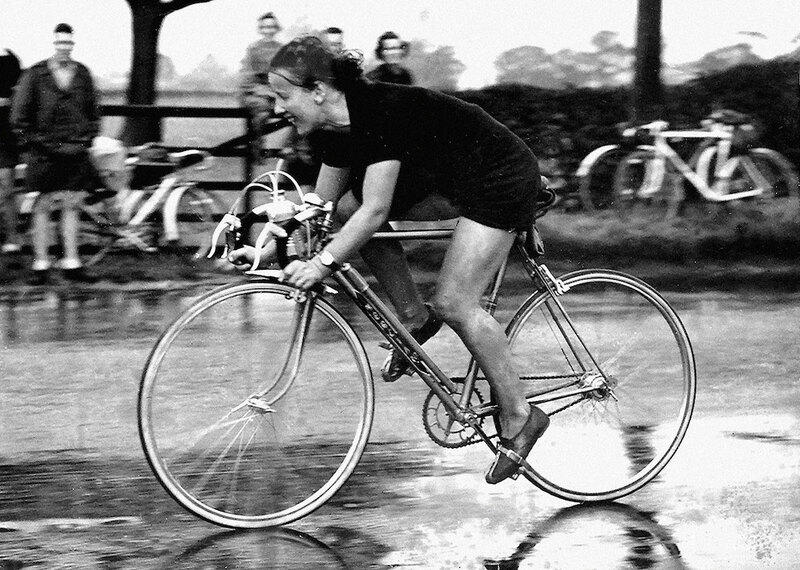 Wonder Wheels is the autobiography of British cyclist Eileen Sheridan. Originally published in 1956, it was republished in 2009 by Mercian Manuals. 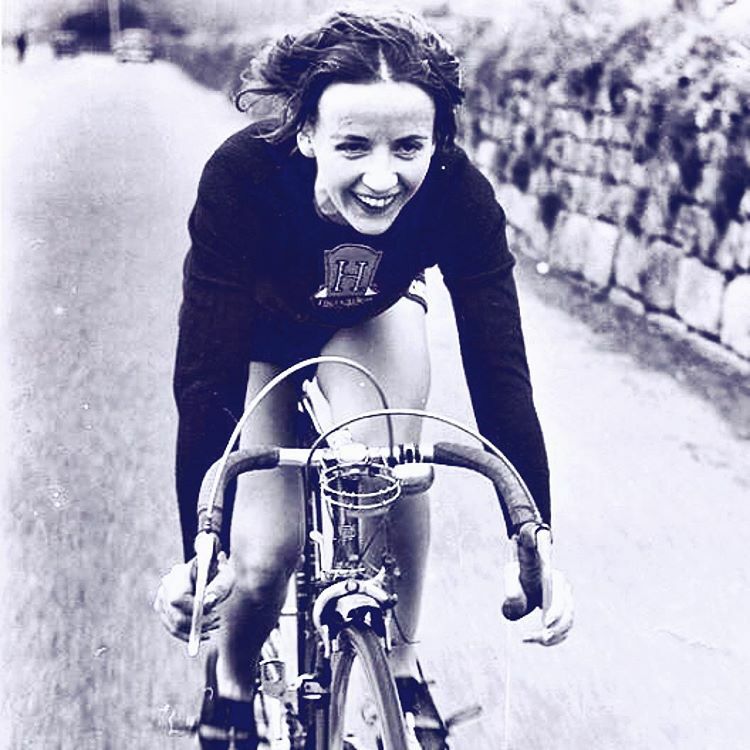 Eileen Sheridan was a female cyclist who turned professional in the 1950s and successfully broke all 21 long distance time trial records – including a new record for Land’s End to John o’ Groats. This is an excellent cycling book and gives an insight into the spirit of amateur time trials and the ‘golden age’ of British cycling in the 1940s and 1950s. Sheridan’s autobiography is fairly short, but it conveys her love of cycling, intrepid determination and cheerful disposition. Like many people in that era, Sheridan got into cycling after becoming a leisure cyclist – joining a local club, taking part in touring rides and then graduating to racing. It was on these long club rides that she started to surprise both herself and other male cyclists with her unexpected capacity for maintaining high speed on these long rides through the Warwickshire countryside and beyond. 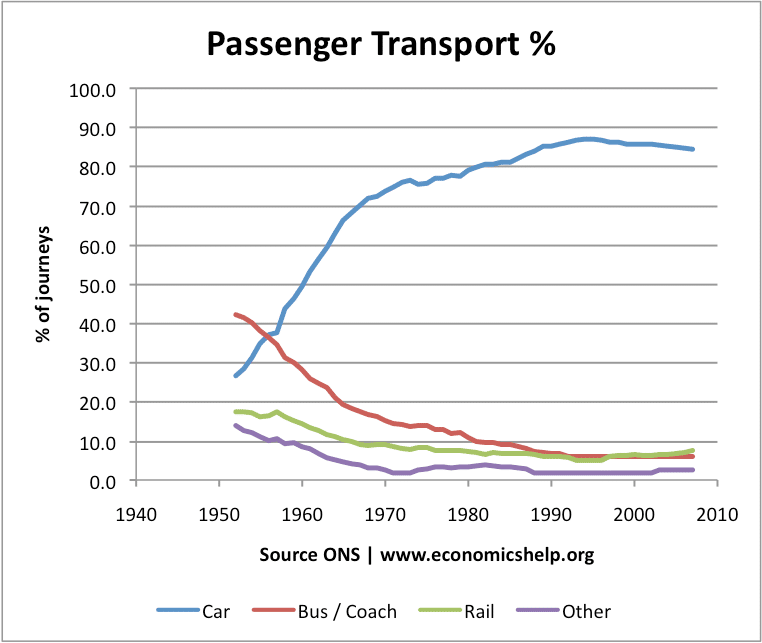 At the moment, there is a good degree of nostalgia about the 1950s, a nostalgia which can be misplaced. But, reading Sheridan’s book you do get a glimpse of a simpler time, where the joy of cycling and the Corinthian ethos of club life were well embedded. It’s hard not to read without an appreciation for the old style Sunday Club Run and touring – even if it is hard to relate to the austerity of the age. This weekend I’m up north. This was during a cycle from Pateley Bridge towards Grassington. A good 50 mile ride with quite a few hills. Furthest I’ve cycled for quite a time. The ride was good. The top of Guise Edge gives a good view; you don’t always spend too much time appreciating this in the hill climb season. The back road between Bolton Abbey and Ilkley. 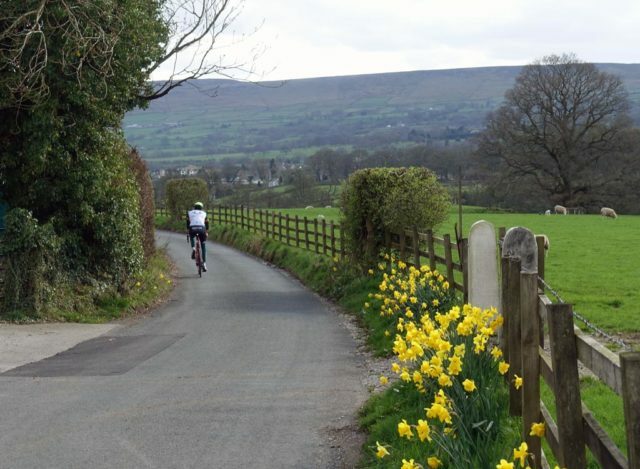 The Yorkshire Dales at Easter is great, especially when the weather was good like on Sunday. 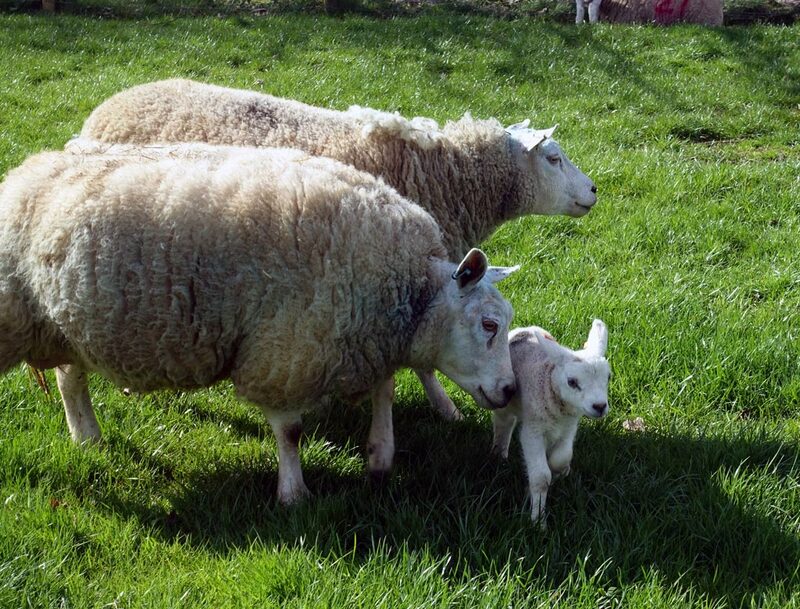 March/early April is lambing time. This lamb seemed quite interested in my bicycle, though his parents more suspicious.